Well, I recently moved and as I was unpacking I started watching The O.C. It is epic. (I learned how to use that word from watching, I think.) It is a bit different from 90210 in that it has characters that are supposed to be funny. It is the same in that everyone is rich, beautiful, and gets good grades without going to class. I think I played high school wrong. Obviously the social clubs help you get into college more than academics. And never, ever, ever having a bag big enough to carry books in. Of course there is one character I can’t stand, but unlike 90210, she is the one that leaves/dies, making season 4 the best season and truly hilarious. Peter Gallagher has some of the best lines of any teen soap. 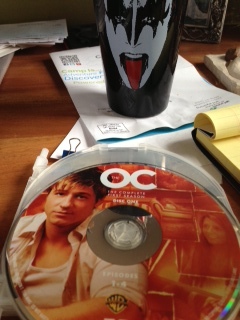 When things are bad, I like to pretend I’m in the O.C. It’s warm there. My hair is always perfect. I can go to sleep in full makeup without breaking out. Bras are an unnecessary accessory. And I have 4-6 really close friends I do everything with for the rest of my life who live in my neighborhood. I just haven’t figured out how to get over the fact that I also have to date all of the men in the group. It’s going to be a really difficult conversation to have with my husband. Wow. This picture sums up so much. This entry was posted in Uncategorized and tagged 90210, family, husband, moving, OC, stalking. Bookmark the permalink.